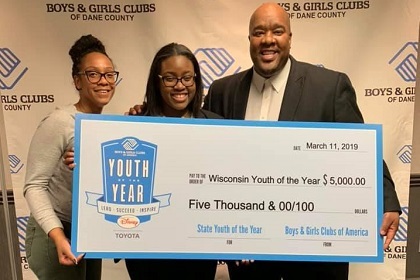 MADISON, WI - Selected among seventeen outstanding finalists from across the state, Savannah Montgomery was crowned Youth of the Year by Boys & Girls Clubs of Wisconsin. Savannah plans to leverage her position to alleviate the stigma of mental health in communities of color, and to connect students with needed resources on trauma informed care as she advocates for more government resources at the local, state, and federal levels. If she wins at the Regional competition, she will compete for the title of National Youth of the Year and an additional $25,000 college scholarship, renewable for four years up to $100,000. During her junior year of high school, Savannah earned an internship in the NICU at the University of Wisconsin Hospital -- an opportunity she accessed through the Dane County Club’s career exploration and internship programming. This internship sparked her curiosity in researching the potential impacts of psychological trauma. Savannah plans on attending a selective university this fall, followed by medical school. Her overall goal is to become a brain surgeon, studying the impact trauma has on the brain.